If you plan this year on visiting one of the most haunted states in America, please don't forget Texas! Many ghost tours through out the state have documented many ghost encounters and serious paranormal activity. Listed below are the best ghost tours in Texas that you could ever hope to encounter real ghosts just by taking a ghost tour. There are many other haunted ghost tours in Texas but these listed here are simply the best that the state has to offer. No other ghost tours or ghost walks come close to these and are often considered and referred to as cheap imitations by many. So please do not be fooled by the claims that others ghost tours might make. If you want the best then seek out the best no matter how far you have to travel. This is the best Ghost Tour you could ever take when visiting Texas! GALVESTON ISLAND HALLOWEEN NIGHT ONLY HUNT GHOST ON A REAL GHOST HUNT TEXAS STYLE WITH THE ONE AND ONLY GHOSTMAN OF GALVESTON ISLAND, TEXAS WITH DASH BEARDSLEY! DASH BEARDSLY ~ The One and only Real Ghost Man of Texas! Beardsley is considered as the Most Haunted Man in the Great state Of Texas. Dash Beardsley is also an active paranormal Investigator. Personally he and has explored many haunted locations through out the great state. When it comes to helping you understand the world of ghosts and all that is haunted Texas Dash is the man to see. If your Haunted In texas Dash is the man to call! Come With Dash view the Island of Galveston as you have never seen it before! Those of you who have not had the rare privilege of traveling back in time with us are highly encouraged to do so! We are certain that even if you don't believe in spirits now, you may very well change your mind after walking the brick lined Haunted Streets of The Strand District. Our private tours are conducted by reservation only. For the next public tour time call our Ghost Line (requiring no reservations) for information and public tour times 409-949-2027. For Private Ghost Tours and other paranormal help insights or real ghostly information call the office line at 832-892-7419. Please call for current ghost Tour prices. Voted by Reader submissions as one of "The Best or Most haunted Ghost Tour in America for you to take and to investigate. Haunted America Tours 2004 - 2009. His tour is ranked as one of the best in the entire USA. Also the new Dash Beardsley's Galveston Most Haunted Cemetery Secret Society Ghost and also the Galveston Vampire Tour Also Dash Beardsley's Haunted Pub Crawl Tour is available. And this is sure to send a cold chill down anyone's spine. You can learn tales of vampires, zombies and also hunt for the Devil's chair. You personally can visit Galvestons' most "Secret Society" of learn it's special "Dead" history. Certainly the famous and the infamous of Galvestons' past rest at "The Old City Cemetery", a conglomerate of seven cemeteries that grew together over decades of time and tempests, since Galvestons' very inception. Dash Beardsley's Secret Socieity Cemetery tour. Also Check our site or email for upcoming schedule for our brand new Galveston tours. This is the second Best Ghost Tour in all of Texas and worth every minute you experience! "More than just a ghost tour!" To ensure your space, prepayment online or reservations are encouraged. Online payments can be made by most major credit cards. Yes this is the premiere ghost tour to take when in San Antonio. A wonderful enlightening tour that leaves you wanting more! And to me that's the best real ghost tour to take! Join a ghost hunt every night as folklore and history come alive! The journey begins at 9:00 PM in Alamo Plaza located across from The Menger Hotel. Embark on an authentic journey to some of the most famous haunted sites in San Antonio! Everyone attending receives equipment to use throughout the duration of this 1 hour 30 minute ghost hunt. We'll show you the latest and never before seen equipment used to detect ghost. Walk the shadowy streets of down town San Antonio covering over 10 locations with proven ghost activity. Use the latest in modern ghost hunting equipment as seen on the television shows Ghost Hunters, Ghost Hunters International, A Haunting, and Paranormal State just to name a few. Hunt for the restless spirits of San Antonio's past while seeing evidence of the ghosts who continue to haunt the San Antonio area! Learn about the difference in ghosts, haunting's and the factual accounts of their death. Ghost Hunts of San Antonio Texas Tour cannot promise that you will experience ghosts on your journey however; many mysterious anomalies have been spotted and photographed by attendees. We can promise that the journey will leave you mystified! This is the most haunted hotspot in all of Jefferson Texas. Do not be persuaded to take a ghost tour other then this one and visit any other supposed or referred to haunted location or ghost tour This is the best in the city and the only one I personally reccomend. "The Most Haunted House In the State Of Texas!" One of the things about The Grove is that it has a reputation for being haunted. The ghost stories go back through many owners - Miss Louise Young, who lived in the house from the early 1900s until her death in the 1980s used to tell her friends about the "haints" that occupied the house with her. Somewhere along the way, though, the fun little ghost stories took a dark turn. In her later years, she was terrified of the spirits. She had a security light installed in the garden because she would see people outside walking around, who disappeared when she turned on the porch light. She called the police several times a week in her later years to report that someone was in the house with her, but the officers never found anyone else there. Finally, she moved into just a few rooms of the house, letting the rest of the place start to deteriorate. "Mitchel Whitington the Most Haunted and Best Paranormal Author in Texas!" Check web site for dates and departure times. The Ghosts & Legends® of San Antonio is the perfect choice for night time family entertainment! 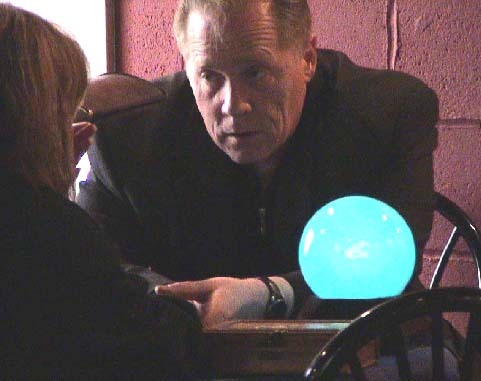 I am a Christian Medium, Certified Paranormal Investigator (University of Nevada), a Certified Parapsychologist (Flamel College) and UFO Investigator .I have lived in a haunted house growing up and has always been a sensitive for as long as I can remember. I have first-hand knowledge and experience with ghosts and other paranormal activity in my private sessions as well as in resident, hotel, and historic buildings throughout the United States including, Las Vegas, New Orleans, Virginia City, Dallas Fort Worth area and many sites in Texas, my home state. A gifted Dowser, I have assisted area Police and Sheriff departments in missing person cases. I have lived in Fort Worth most of my life and enjoy sharing the history that the city has to offer. "The Other Ghost Capitol of Texas"
And this tour proves it every night! he Alamo Ghost Hunt Tour, our evening tour, was the most broadcasted Ghost Tour in San Antonio We visit 13 haunted locations, starting beside the outside wall of the Ripley's Believe It or Not! The address is 307 Alamo Plaza. The hardest thing about taking our tours is not being fooled into getting on the wrong tour You will see two of the cities Oldest Hanging Trees, an Old Spanish Palace, Battlefields, Old Hotels, Cemeteries and the Alamo Plaza Area. We bring ghost-hunting equipment for people to use so the whole crowd can have a ghost hunting experience while hearing about the ghost. San Antonio and Texas Ghost Tours ghost stories about San Antonio Texas. Walk through Graveyards and ride in your Own Private Limo. Go on the most popular ghost tour in San Antonio for the last 11 years with internationally recognized ghost hunter Martin Leal. Learn about the latest ghost sightings at the most haunted locations in San Antonio. We are the THE local experts on current ghost activity in San Antonio and will cover the latest sightings at The Alamo, the oldest cemetery in Texas, the Oldest Hotel in Texas, the hospital turned into a hotel and the old jail that is now a hotel. TEXAS for the last ELEVEN years and counting. WHEN: Every night of the year at 8:30pm. HOW MUCH: $10 for adults, 7-17 are $5. Under 6 are free. CALL: 210-348-6640 to give us notice of your group size. only the most up to date ghosts activity. REAL GHOST ACTIVITY??? the most haunted cities in America. Imaging included on most nights. excitement is about. This is the most televised ghost tour in Texas. be viewed from an article in Texas Monthly. RECOMMENDED GHOST TOUR IN TEXAS by the media and public. Since 1988, DHT has conducted 3,664 tours for more than 49,200 people from around the world. On these tours, designed by Sandra Lord, you'll experience history, art, architecture, the paranormal, shopping, dining, and more, all flavored with Houston's unique multicultural spirit. Join Discover Houston Tours and find out why Texas means friendly. Since 1988, DHT has conducted 3,680 tours for more than 49,500 people from around the world. On these tours, designed by Sandra Lord, you'll experience history, art, architecture, the paranormal, shopping, dining, and more, all flavored with Houston's unique multicultural spirit. ADVANCE PAID RESERVATIONS ARE ALWAYS REQUIRED. For available dates and to purchase tickets for public tours, please go to the Tour Calendar. These and other tours are also available for private groups of 10 of more on the date of your choice. Sign up HERE for DHT's ENewsletter. Read Sandra Lord's Discover Houston Tours Blog. Discover Houston Tours is a proud member of the Greater Houston Convention & Visitors Bureau and the Professional Tour Guide Association of Houston. Everyone receives a copy of Sandra Lord's "Short Guide to the Paranormal." Start/End: Discover Houston Tours, 912 Prairie Street, Houston, Texas 77002. Parking is free after 6 p.m. and on weekends, except at specially marked meters. For an interactive parking map, please go to www.HoustonDowntown.com. Registration:6:30 p.m. * Tour: 7 p.m.-10 p.m.
For available dates and to purchase tickets, please go to the Tour Calendar. Haunted Texas is the second-largest U.S. state in both area and population, Many believe that it is the most haunted by personal bragging rights. The name, meaning "friends" or "allies" in Caddo, was applied by the Spanish to the Caddo themselves and to the region of their settlement in East Texas. Located in the South Central United States, Texas is bordered by Mexico to the south, New Mexico to the west, Oklahoma to the north, Arkansas to the northeast, and Louisiana to the east. Texas has an area of 268,820 square miles (696,200 km2), and a growing population of 24.7 million residents. Houston is the largest city in Texas and the fourth-largest in the United States, while Dallas–Fort Worth and Houston are the fourth and sixth largest United States metropolitan areas, respectively. Other major cities include San Antonio, El Paso, and Austin—the state capital. Texas is nicknamed the Lone Star State to signify Texas as an independent republic and as a reminder of the state's struggle for independence from Mexico. The "Lone Star" can be found on the Texas State Flag and on the Texas State Seal today. Texas is also home to Lone Star Bigfoot, Texan Chupacabra, Ghosts wild Cyotte and many indian sprits and battlefield dead. The term "six flags over Texas" came from the several nations that had rule over the territory. Spain was the first European country to claim the area of Texas. France held a short-lived colony in Texas. Mexico controlled the territory until 1836 when Texas won its independence, becoming an independent Republic. In 1845 it joined the United States as the 28th state. The state's annexation set off a chain of events that caused the Mexican–American War in 1846. A slave state, Texas declared its secession from the United States in early 1861, joining the Confederate States of America during the American Civil War. After the war and its restoration to the Union, Texas entered a long period of economic stagnation. One Texas industry that thrived after the Civil War was cattle. Due to its long history as a center of the industry, Texas is associated with the image of the cowboy. The state's economic fortunes changed in the early 1900s, when oil discoveries initiated an economic boom in the state. With strong investments in universities, Texas, in the mid twentieth century has developed an diversified economy developing many high tech industries. Today it has more Fortune 500 companies than any other U.S. state. With a growing base of industry, the state leads in many industries, including agriculture, petrochemicals, energy, computers and electronics, aerospace, and biomedical sciences. It leads the nation in export revenue since 2002 and has the second-highest gross state product. This is a must read for all Texans, used-to-be Texans, adopted Texans or wanna-be Texans! You guessed it. It's on the state line. If you actually understand these jokes, and share them with all your Texas friends, you definitely live in Texas! 5. The Flagship Hotel in Galveston is the only hotel in North America built over water. Destroyed by Hurricane Ike -2008! 6. The Heisman Trophy was named after John William Heisman who was the first full-time coach at Rice University in Houston . 10. The worst natural disaster in U.S. history was in 1900, caused by a hurricane, in which over 8,000 lives were lost on Galveston Island . 11. The first word spoken from the moon, July 20,1969, was " Houston ," but the space center was actually in Clear Lake City at the time. 12. King Ranch in South Texas is larger than Rhode Island ..
14. Texas is the only state to enter the U.S. by TREATY, (known as the Constitution of 1845 by the Republic of Texas to enter the Union ) instead of by annexation. This allows the Texas Flag to fly at the same height as the U.S. Flag, and may divide into 5 states. 17. Dr Pepper was invented in Waco in 1885. There is no period in Dr Pepper..
18. Texas has had six capital cities: Washington -on- the Brazos, Harrisburg , Galveston ,Velasco, West Columbia and Austin . 20. The San Jacinto Monument is the tallest free standing monument in the world and it is taller than the Washington monument. 21. The name ' Texas ' comes from the Hasini Indian word 'tejas' meaning friends. Tejas is not Spanish for Texas . 22. The State Mascot is the Armadillo (an interesting bit of trivia about the armadillo is they always have four babies. They have one egg, which splits into four, and they either have four males or four females...). 23. The first domed stadium in the U.S. was the Astrodome in Houston . (6) No foolin' around with another fellow's gal..